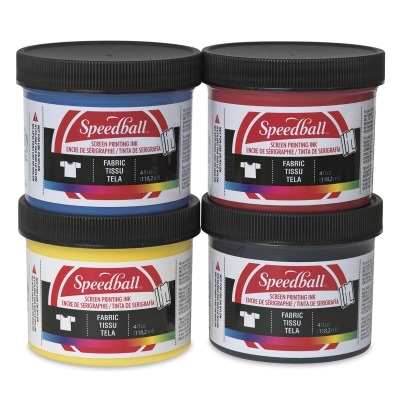 Speedball Waterbased Fabric Screen Printing Inks are great for use on light-colored cotton, linen, blends, polyester, rayon, and other synthetic fibers (except nylon). Use the process colors for 4-color process printing. The inks can also be brush-applied to tennis shoes, canvas bags, and more. Use them with water-resistant hand-cut films or direct emulsions such as Speedball Diazo Photo Screen Printing Emulsions or Speedball Drawing Fluid. Recommended screen fabric is 74-124 mesh monofilament or 6XX to 10XX multifilament. Clean ink from screens with water. Inks should not be allowed to dry in the screen. Transparent Base for Fabric and Acrylic — Create transparent colors for fabrics and acrylic inks. Do not add more than 10–15% of extender base in relation to ink volume. Starter Colors, Set of 6 — The Starter Set includes six different colors in 4 oz jars. Colors include: Black, Red, Blue, White, Green, and Yellow. 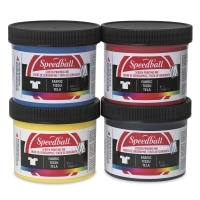 Basic Colors, Set of 4 — This set includes one each of Black, Red, Blue, and Yellow. 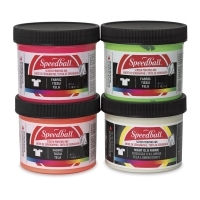 Fluorescent Colors, Set of 4 — This Set includes one each of Fluorescent Hot Pink, Fluorescent Lime Green, Fluorescent Orange, and Night Glo Original.